Hundreds of people gathered Monday, October 29, 2018 in front of Woodburn Hall at WVU's downtown campus to mourn the deaths of 11 congregants killed at a shooting Saturday at the Tree of Life synagogue in Pittsburgh. The crowd at a vigil held Monday, October 29, 2018 at WVU in honor of the victims of the Tree of Life shooting in Pittsburgh. Speakers at a vigil hosted by Jewish student leaders at WVU gather to sing. 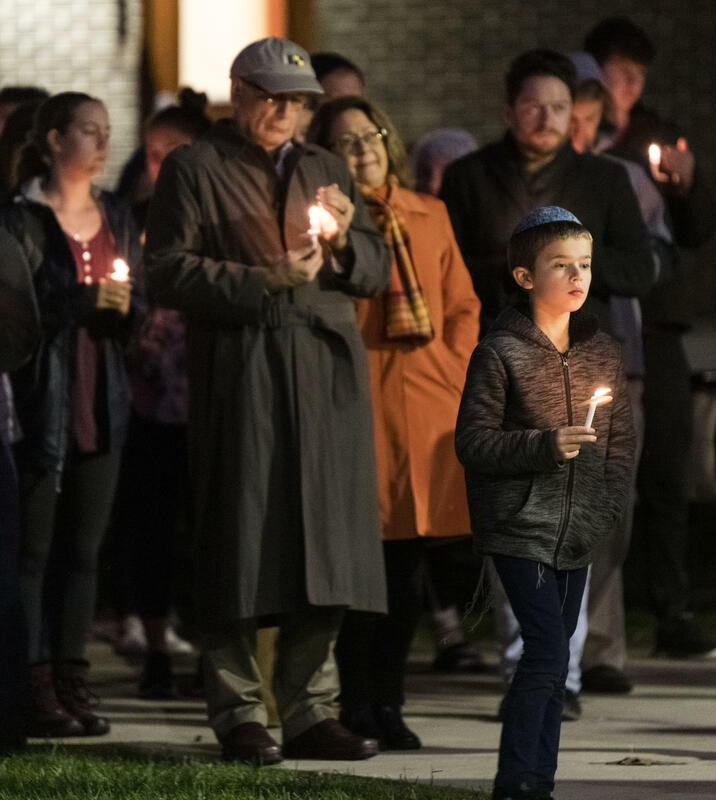 Hundreds of people gathered at a vigil held at West Virginia University to honor the victims of the shooting at the Tree of Life synagogue in Pittsburgh, and offer a message of both vigilance and healing to the Jewish community, both in Morgantown and around the world. WVU students and staff, and Morgantown community members braved chilly temperatures and the threat of rain to stand shoulder to shoulder Monday, Oct. 29, in front of Woodburn Hall, on WVU’s downtown campus. The "Stronger Than Hate" vigil was put together by Jewish student leaders at WVU. "You hear about all these shootings and they’re across the country," said Zack Levenson, a senior political science major at WVU, president of the Rohr Chabad Jewish Student Center on campus and vice president of Jewish fraternity, Alpha Epsilon Pi. "And then it’s your community and it’s an hour away. I’ve driven by that synagogue and it’s the least I could do, the least we could do as organizers, to support Jewish students on campus and the Squirrel Hill community." Levenson said the student community wanted to create a space to mourn the 11 people gunned down Saturday at the Tree of Life synagogue in Pittsburgh, but also to share the message that hate will not win. Participants, some bearing homemade signs naming the victims, some that simply read "Love," lit flickering candles in honor of those killed and injured. Attendees of a vigil at WVU hold candles to honor those who were killed at a shooting Saturday, October 27, 2018 at the Tree of Life synagogue in Pittsburgh. Some of the speakers held personal connections with many of the Tree of Life synagogue victims. Pamela Murray, vice-chair of the department of pediatrics/adolescent medicine at WVU, knew many of those killed. "People can be incredibly special and generous," Murray said of those who were killed. "But hate is awful and hate speech can be evil. In this case, guns were the agent of this hatred that destroyed lives and has had an impact on a very large community." She and others noted that the Jewish community has long faced persecution, but data collected by the Anti-Defamation League finds anti-Semitic incidents are becoming more common. The nonprofit said incidents spiked nearly 60 percent in 2017, compared to 2016 numbers, the largest single-year increase on record and the second highest number reported since ADL started tracking incident data in the 1970s. For some, Saturday's violence hit very close to home. Judy and Bob Danenberg are members of the Tree of Life synagogue in Pittsburgh. They were out of town when the shooting occurred, but told the crowd they knew many of those who were killed. 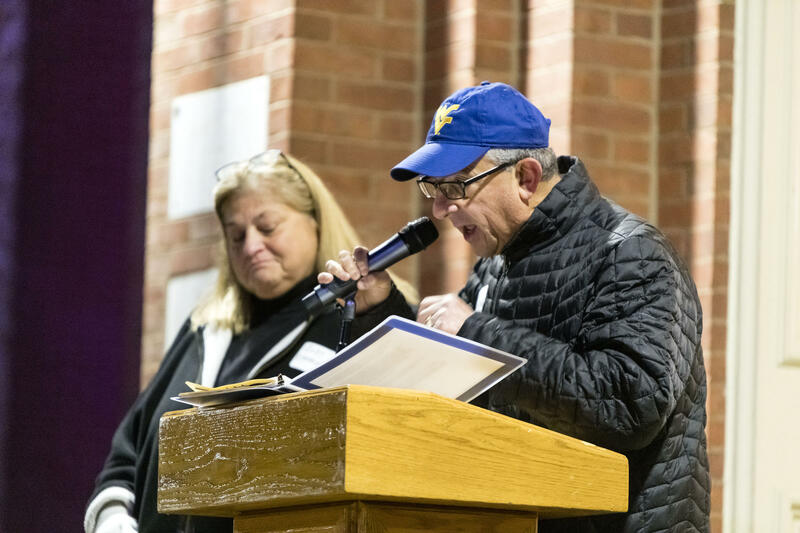 Bob and Judy Danenberg, members of the Tree of Life congregation in Pittsburgh, address hundreds of people gathered a vigil in front of Woodburn Hall at WVU's downtown campus on Monday, October 29, 2018. "We as the Jewish community are mourning in Squirrel Hill right now," she said, fighting tears. "Having you here tonight shows solidarity. It has been the reaching out of all kinds of people, Jewish, non-Jewish, Muslim, all over the world that has been reaching out to us. It is the strength that we all need together." Danenberg added that in the face of hate, it is more important than ever to hug those you love. "Spread good, spread love, spread joy -- not the message of hate," she said. The Jewish holiday of Hanukkah began December 6, and continues through December 14th at sundown. In light of Hanukkah, this week's show features Jewish Appalachians, a group that’s not really talked about a whole lot. Jewish communities across West Virginia are struggling to keep their traditions alive. The first Jewish residents moved to Morgantown in 1879. Since then, the community has made quite a mark on the city. A few years ago, the then-president of the Tree of Life Congregation and Synagogue in Morgantown asked now-President Ed Gerson to write a history of the congregation for a time capsule. Instead, Gerson interviewed about 20 members of the Jewish community and documented their stories in a book of oral histories. The book, called Morgantown Jewish Heritage, was released this month. On this West Virginia Morning, we hear an Inside Appalachia preview. In honor of the Jewish holiday of Hanukkah, which begins Dec. 12, this weekend’s episode of Inside Appalachia explores stories of Jewish-Appalachians.